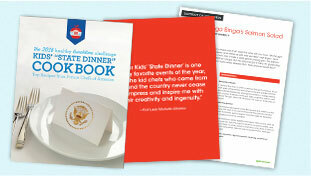 Kids' "State Dinner" | Let's Move! The 2016 Kids' "State Dinner"
First Lady Michelle Obama once again teamed up with PBS flagship station WGBH Boston, the U.S. Department of Education, and the U.S. Department of Agriculture (USDA) to host the fifth annual Healthy Lunchtime Challenge to promote cooking and healthy eating among young people across the nation. 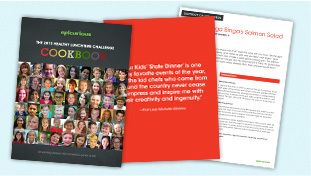 The challenge invited kids ages 8-12, in collaboration with a parent or guardian, to create an original, healthy, affordable, and delicious lunch recipe. Entrants were encouraged to reference ChooseMyPlate.gov to ensure recipes met the USDA’s recommended nutrition guidance by representing each of the food groups, either in one dish or as parts of a lunch meal, including fruits, vegetables, whole grains, lean protein, and low-fat dairy. In addition, in celebration of the MyPlate, MyState initiative, the 2016 challenge put a spotlight on homegrown pride across the country and encouraged entries to include local ingredients grown in the entrant’s state, territory, or community. Fifty-six young chefs representing each U.S. state, five territories, and the District of Columbia were selected as the Healthy Lunchtime Challenge winners. They joined First Lady Michelle Obama at the White House for the fifth annual Kids' “State Dinner” where they enjoyed a delicious lunch featuring a selection of the winning recipes. Check out the top five moments from the 2016 Kids' "State Dinner"
Behind the Scenes Judging of the 2015 Kids' "State Dinner"
Check out photos from the 2015 Kids' "State Dinner." The 2014 Kids' "State Dinner"
Behind the Scenes Judging of the 2014 Kids' "State Dinner"
Check out photos from the 2014 Kids' "State Dinner."